The island of Sir Bani Yas is located 170kms west of Abu Dhabi, the capital of the United Arab Emirates. 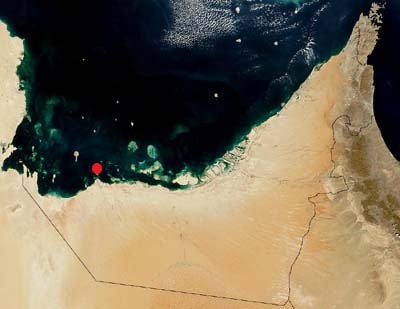 It lies 9kms offshore from Jebel Dhanna. The island is 17.5kms from north to south and 9kms from east to west. The bare mountains in the central area rise to a height of 148 m.
SBY1 Late Pre-Islamic period pottery scatter on ridge above al-Khawr, east part of island. SBY2 Late Pre-Islamic period structure and pottery scatter, east part of island. SBY3 Late Pre-Islamic period courtyard house, east part of island. Next to llama pen. SBY4 Late Pre-Islamic period courtyard house, east part of island. NE of llama pen. SBY5 Late Pre-Islamic period ?courtyard house, east part of island. SBY6 Late Pre-Islamic period courtyard house, east part of island. SBY7 Late Pre-Islamic period courtyard house, east part of island. SBY8 Late Pre-Islamic period low mound, east part of island. SBY9 Late Pre-Islamic period occupation mound. Excavations conducted here between 1994-6 uncovered a Nestorian monastery and church dating to the sixth-seventh centuries AD. 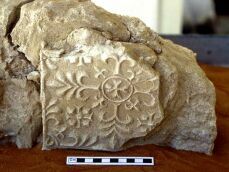 Stucco decoration recovered from the excavations included fragments of Nestorian crosses and vine-and-scroll patterns. View fragments of decorated plaster via the external website, the Virtual Museum on the http://www.uaeinteract.com/ website, produced by Trident Press. SBY10 Late Islamic period mosque within plantation enclosure in the Butabr area, north coast of island. SBY11 Late Islamic period cemetery with at least 45 graves, north coast of island. SBY12 Rectangular cistern, built pre-1938, located in the old, well-established palm-grove at al-Nakhayl. SBY13 Late Islamic period cemetery with 17 graves at northern end of island. SBY14 Late Islamic period settlement at northern end of island. SBY15 Circular stone cairn ca. 2m in diameter of unknown date. SBY16 Circle of stones of unknown date, east part of island. SBY17 This site code was cancelled. SBY18 Late Islamic period campsites with depressions and cairns, northern end of island. SBY19 Later Islamic period campsite at northern end of island. SBY20 ?Pre-Islamic period cairn at northern end of island. SBY21 Late Islamic period settlement. Part of the abandoned village of al-Zahir, located at the northern end of the island. SBY22 Late Islamic period well and house remains. Part of the abandoned village of al-Zahir, located at the northern end of the island. SBY23 Late Islamic period structure, butchery and campsites, including pottery scatters, located at the northern end of the island. SBY24 Late Stone age lithics scatters and cairns, located at the northern end of the island. SBY25 Shallow depression of unknown date, located at the northern end of the island. SBY26 Group of at least seven Late Islamic period graves, located at the northern end of the island. SBY27 ?Pre-Islamic period cairn, located at the northern end of the island. SBY28 ?Pre-Islamic period cairn, located on the western side of the island. SBY29 ?Pre-Islamic period cairn, located on the western side of the island. SBY30 Islamic period campsite and two or three graves located on NW side of the island. SBY31 ?Pre-Islamic period cairn, located on the eastern side of the island, overlooking the llama pens at Khawr al-Janubi. SBY32 Late Islamic period campsite and fishing/pearling beach, located on western coast of the island. SBY33 Late Islamic period campsite with pearl oyster midden and occasional dugong bones, located on western coast of the island. SBY34 Late Islamic period cemetery, with four burials, located on western coast of the island. SBY35 Late Islamic period tower. Only scattered remains of masonry survived. Located on NE side of the island. SBY36 Salt mine of unknown date located in the Wad'l-Milh, on the western side of the central hills. Six mine shafts were visible including deep shafts. Visit a Gallery of pictures from Sir Bani Yas. 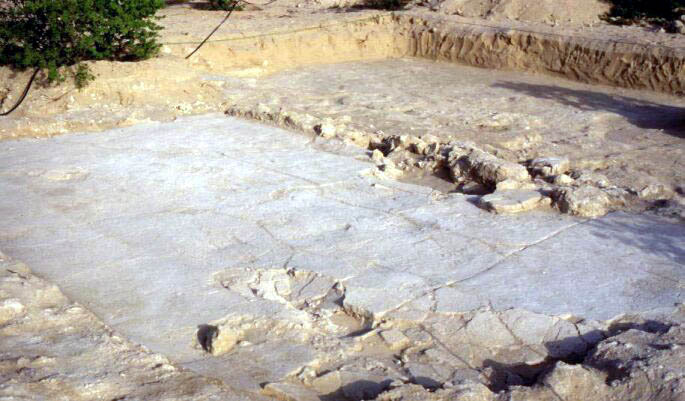 View fragments of decorated plaster from a pre-Islamic church on Abu Dhabi's island of Sir Bani Yas (via the external website, the Virtual Museum on the http://www.uaeinteract.com/ website, produced by Trident Press). Aston, E.R. 1985. A Brief Geology of Sir Bani Yas. Bulletin of the Emirates Natural History Group 27: 2-4. Elders, J. 2001. The lost churches of the Arabian Gulf: recent discoveries on the islands of Sir Bani Yas and Marawah, Abu Dhabi Emirate, United Arab Emirates. Proceedings of the Seminar for Arabian Studies 31: 47-58. [ to download this article in Acrobat .pdf format click here (1.36 MB) ] . Elders, J. 2003. The Nestorians in the Gulf: Just Passing Through? In: D.T. Potts, H. Naboodah and P. Hellyer (eds. 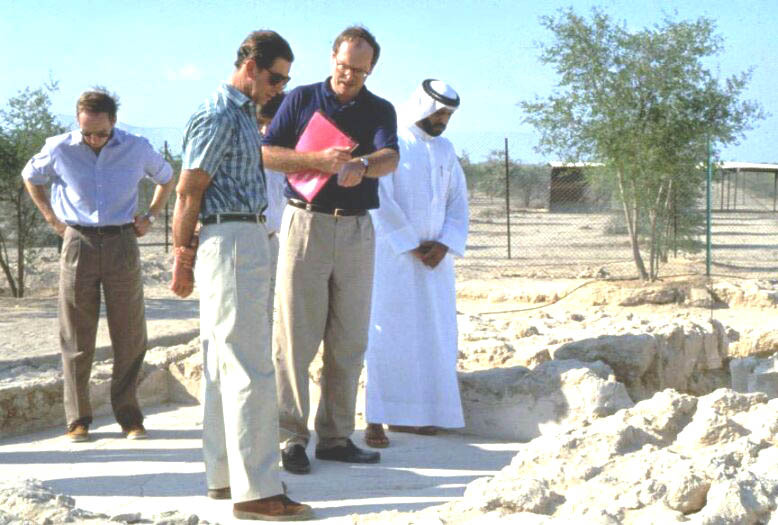 ), Proceedings of the First International Conference on the Archaeology of the United Arab Emirates (Abu Dhabi, 15-18 April 2001). Trident Press, London. pp. 229-236. Hellyer, P. 1993d. New discoveries on Dalma and Sir Bani Yas. Tribulus (Journal of the Emirates Natural History Group) 3.2: 16. [ to download this article in Acrobat .pdf format click here (126 Kb) ] . Hellyer, P. 2001b. Nestorian Christianity in Pre-Islamic UAE and Southeastern Arabia. Journal of Social Affairs 18 (No.72): 79-99. [ to download this article in Acrobat .pdf format click here (2.5 MB) ] . King, G.R.D. 1997a. 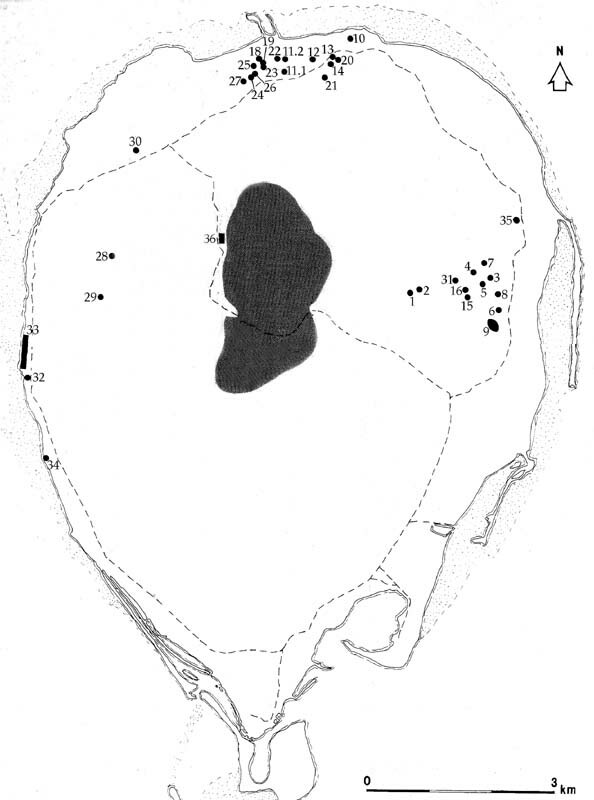 A Nestorian monastic settlement on the island of Sir Bani Yas, Abu Dhabi: a preliminary report. Bulletin of the School of Oriental and African Studies 60(2): 221-235. [ to download this article in Acrobat .pdf format click here (2.3 MB) ] . King, G.R.D. 1997b. The History of the U.A.E. : The Eve of Islam and the Islamic Period. In: E. Ghareeb and I. Al-Abed (eds. ), Perspectives on the United Arab Emirates. Trident Press: London. pp.74-94. [ N.B. this chapter is now superceded by King 2001 - to download this article in Acrobat .pdf format click here ] . King, G.R.D. 2001. The coming of Islam and the Islamic period in the UAE. In: I. Al-Abed and P. Hellyer (eds. ), The United Arab Emirates: A new perspective. Trident Press, UK. pp.70-97. King, G.R.D. and P. Hellyer. 1994. 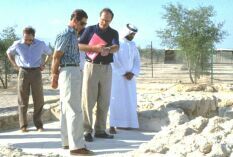 A Pre-Islamic Christian site on Sir Bani Yas. Tribulus (Journal of the Emirates Natural History Group) 4.2: 5–7. [ to download this article in Acrobat .pdf format click here (343 Kb) ] . Krivánek, R. 1997. Geophysical survey on archaeological sites on Sir Bani Yas island, Abú Dhabi (UAE) - Geofyzikální pruzkum na archeologických lokalitách na ostrove Sir Bani Yas (Spojené Arabské Emiráty). Památky archeologické 88 (1): 142-150.